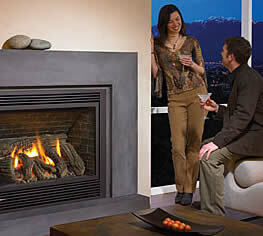 You can make any room a great room with the Panorama® P40 fireplace as a focal point. Featuring the Trinity Flame™, this fire is complete with crackling Oak Logs and rich glowing embers. Cradled in a cast iron fender, the warmth and elegance of this fire will fool even the most discerning guest. Heat output and seven fire stages can be controlled by the FireWizard™ Remote.